The brand of the Alzheimer's Association represents who we are and what we do: Our dual mission of people and science and a commitment that guides us in our daily work in providing support, research, advocacy and education. Our vision is a world without Alzheimer's.Purple is our signature color, combining the calm stability of blue and the passionate energy of red. Purple makes a statement about our Association and our supporters: we are strong and unrelenting in the fight against Alzheimer’s disease. 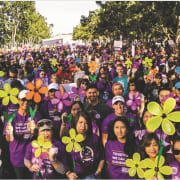 In 2018, we committed over $160 million to best-in-class research projects in 25 countries, raised more than $96 million through Walk to End Alzheimer’s(r), tripled Alzheimer's research funding with the National Institutes of Health over the last three years at the urging of the Association and thousands of advocates Nearly, and received 300,000 calls to our free 24/7 Helpline 800.272.3900.